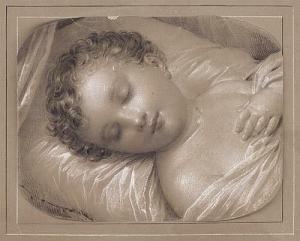 Find artworks, auction results, sale prices and pictures of Felice Schiavoni at auctions worldwide. signed lower right: F Schiavoni . 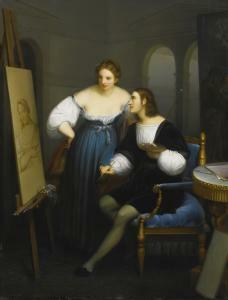 f. 1832 oil on panel 26 3/4 by 20 1/2 in. ; 67.9 by 52 cm. Though traditionally identified as a historicized depiction of Raphael painting beside an easel, the Renaissance portrait depicted within this scene is in fact Sebastiano del Piombo's Portrait of a woman in the Uffizi, Florence. Such confusion in the identification of the painting may have originated from the fact that Sebastiano's picture was long considered to be by Raphael, and was still the prevailing attribution until only a few years before Schiavoni painted this lyrical composition in 1832. Another version of the composition, dated two years after the present picture, is located in the Pinacoteca Tosio Martinengo, Brescia. the figure as well as a bold and aggressive color palette. Nicholas I and Alexander II who sought portrait commissions. Notes: This painting constitutes a noteworthy addition to the interesting body of portrait paintings executed by Filippo Schiavoni. 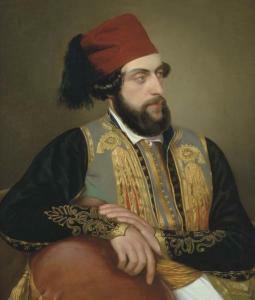 Schiavoni, alongside his father Natale, dominated the artistic scene in Venice, Trieste and Milan during the second half of the 19th Century where the two painters quickly built a solid reputation at the various art fairs, attracting collectors and private commissions. Felice's portraiture is characterized by a high degree of precision and polish resplendent in the crisp, clean outline of the figure as well as a bold and aggressive color palette. 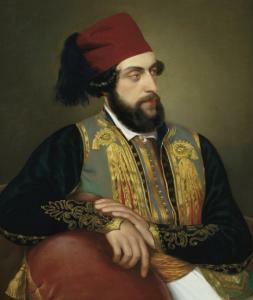 Despite the lack of scholarly attention on the artist it is important to note that Schiavoni enjoyed considerable fame during his lifetime, and attracted such important patrons like Czar Nicholas I and Alexander II who sought portrait commissions. In this stunning portrait, Schiavoni showcases his talent for handling textile and has rendered with a stunning virtuosity the Greek-inspired dress, seen often in the area of Venice in those years during the Greek-Turkish conflict, possibly worn in sympathy for the Greek cause. We are grateful to Prof. Fernando Mazzocca for confirming the authenticity of this work.